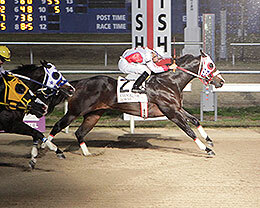 Ivan James, under jockey Raul Ramirez, Jr., easily winning the $156,780 Evangeline Downs Derby Saturday night at Evangeline Downs. OPELOUSAS, LA�DECEMBER 17, 2016�Multiple graded winner Ivan James closed out an impressive race career on Saturday when he defeated Jess Bein The Hero by half-a-length in the $156,780 Evangeline Downs Derby at Evangeline Downs. Bloomer Ride finished a head back in third place. Ridden by jockey Raul Ramirez, Jr., Ivan James was in command throughout as he completed the 400 yards in :19.825 seconds, a 94-speed index into a 12-mph headwind. Jose Sanchez saddled the son multiple stakes sire IVORY JAMES for owner/breeder Jorge Meraz. Bred in Texas from the Dashin Bye mare First Dashin Bye, Ivan James has compiled a (10) 6-2-1 record and the $78,390 EVD Derby winner's purse boosted his career mark to $477,207. The bay colt also won the Sam Houston Futurity(G2), Firecracker Derby and was second in third in the Firecracker Futurity(G2). He entered the EVD Derby as the fastest qualifier and closed out his career with three consecutive wins. Making just his third career start, Jess Bein The Hero picked up $26,653 for his second-place effort. The son of leading sire Valiant Hero entered the race with a perfect 2-for-2 record under the director for trainer Miguel Rodriquez. Joe Badilla, Jr. rode the black colt for owner Juan Martinez-Labastida. Curtis Crenwelge bred Jess Bein The Hero in Texas from the Mr Jess Perry mare Jess Braggin. Francisco Vega's Bloomer Ride earned $16,678 for finishing third. Trey Ellis conditions the multiple stakes-placed son of Pyc Paint Your Wagon out of Ja Fantasy by Mr Jess Perry. S Bar S is the breeder and Rodrigo Vallejo was riding. Politically Corrupt, Dynamite 123, Octonaut, Dash Dont Cheat, Motorboatin, Zoominforgrady and Tf Little Bit Rowdy completed the field.